One of our favorite times of year is here and being outdoors is not only fun, but even more importantly, it’s good for the mind, body, and soul. Getting up close and personal with Mother Nature is also scientific. Research proves the need for time out in nature. We’ve long known that a breath of clean air works wonders on our respiratory systems and that sunlight generates vitamin D – the vitamin essential to healthy bones. However, an increasing amount of research from around the world is reveals many reasons why time outdoors is actually a necessity. Get a daily dose of vitamin D.
Vitamin D is essential for a well-functioning body. It helps us absorb calcium, it prevents osteoporosis, and it reduces inflammation, among other things. Although vitamin D is present in some foods, like salmon and fortified milk, we get more than 90 percent of our vitamin D from casual exposure to sunlight. Trees are good for us. Spending time in a forest has a proven positive impact on reducing stress levels and lowering blood pressure. Research done in Japan, a country of long working days and high suicide rates, reveals that immersing yourself in the natural world significantly reduces stress levels and wards off depression. Modern multitasking overtaxes the areas of our brain involved in distractions, creative thinking, and developing a sense of identity. Scientists say even four days backpacking in nature can improve creativity by 50%. Our sense of smell is closely linked to the parts of the brain responsible for processing emotion. The scents we inhale have an immediate and profound impact. Trees and plants emit phytoncides – a volatile organic compound and wood essential oil. Inhaling phytoncides slow down breathing and reduces anxiety. Most of us enjoy being in or on water whether it is a lake, river or ocean. Water plays an essential role in our psychological well-being due to the negative ions it emits. These act like natural antidepressants and release feel-good endorphins. Our world seems to shrink as we grow older and as it does — all the physical, emotional and social benefits of the outdoors can also diminish in our lives. 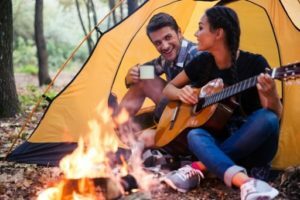 There is a definite connection between spending less time outdoors and the acceleration of dementia as well as weight gain and general depression.